Now, and for the decade ahead, you must manage your career like the business it is! You are the CEO of your career, so never turn its management over to anyone else. How to "take charge of your career" is the message in It's Your Career – Manage It! It's a roadmap to job security, career advancement and success. Career & Self Assessment: Discover the "right" career and job for you. Find out what you offer employers, so they want to hire you. Writing An Interview-Generating Resume: Learn how to write a resume that tells the employer where and why you "fit" in the organization. Effective Interviewing: It's from an interview that you get a job offer, so know what questions will be asked and how to answer them. Power Negotiating: Learn the secrets to getting the most compensation and benefits in your next job. Plus, you'll find 3 Key Tactics: how to...Network with friends, relatives and co-workers for job leads (nearly ¾ of all jobs are found this way); work with Employment Agencies & Headhunters; Research companies & job opportunities. Embracing Change & Profiting From It! A 70-minute audio CD – How To Find And Land A Great New Job. 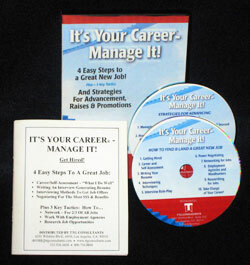 A 60-minute audio CD – Strategies For Advancing In Your Career. A 70-page Action/Success Guide – a handbook with assessment exercises, resume samples, research websites, interview questions and answers, salary and benefits negotiation tactics – and so much more. A Guide to the useful O*NET website. 24-Hour Access To On-Line Job-Search Help � for only $50 per month! Through our continuing efforts to meet your career management needs, we have custom designed a high-tech, online service to bring you the best company and industry research tools, international databases and lead generation technology available today. These online services – together with career and self-assessment, job-search strategy tools and professional resume and cover letter development – provide the most cutting-edge, robust, job-search/career-management system ever offered. Opening New Doors® –TTG's Rapid Re-Employment System – a 430-page reference/learning/action guide (an encyclopedia for job-search & career-management). A 4-Hour Audio Guide to Job-Search – in mp3 format for downloading to I-Pods. Company & Industry information – Hoovers and Dun & Bradstreet provide access to information about 65 million companies and 85 million people in hundreds of industries – with company overviews, key information, biographies and business intelligence (articles, etc.). Job Leads – technology that continually scans thousands of companies and commercial job-posting sites in over 150 categories for "job trigger events" (actual job posting and other job opportunity events). Thousands of these new "job trigger events" occur every day. This is an extraordinary time saver! Recruiters/Headhunters – access to thousands of recruiters throughout the world to whom resumes can be sent electronically. International Database – surveying worldwide career opportunities. E-library – hundreds of links to relevant career development sites and an A-Z index to find exactly the information needed. Social Media/Networking – users are seamlessly connected to the most used social media/networking sites (LinkedIn, Facebook and Twitter) – identifying networking opportunities and prospective contacts. RSS Media Feeds – print, broadcast and digital media feeds about target companies are automatically downloaded and stored. JobSearch – Campaign Tracing & Contact Management – technology that tracks target companies and stores key contacts, notes, resumes, cover letters, and position descriptions for scheduling follow-up calls and interviews. Now, start your move up!